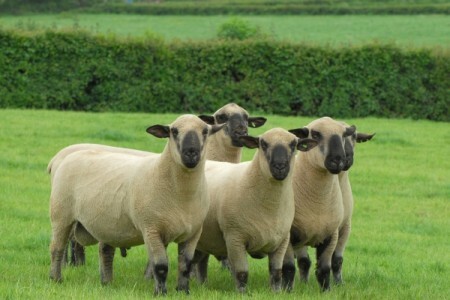 Hampshire Sheeps face and ears are a rich dark brown, approaching black, with wool over the poll and forehead. Wool is white with an average staple length. Body deep and symmetrical with ribs well sprung, broad, straight back, flat loins, wide rump and deep heavily muscled hind legs and breast. Legs being strongly jointed and powerful are set well apart. Average mature ewe weighs 80kg, rams 120kg.